How would you describe your book “Wrecking Crew”? 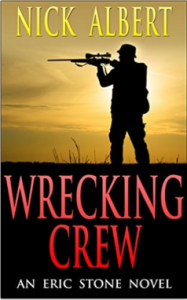 Wrecking Crew is my third book, but the first thriller I have written. It was published in 2014 and at the moment it’s available in paperback and on Amazon kindle. The reviews have been very positive; someone described it as being a civilian spy story. I liked that! Can you briefly describe the storyline for our readers? When Eric Stone discovers the shocking truth behind his friend’s death, he feels compelled to act. Stone is no stranger to risk, he’s a tough guy who will do whatever it takes to get the job done, but this time he’s walking directly into the sights of the most dangerous adversary he has ever faced. The Wrecking Crew is a powerful and secretive organization that mixes modern technology with old fashioned violence to manipulate businesses and empower Governments. Eric Stone’s friend got in their way and paid with his life, now it’s time for some retribution. With the help of his feisty girlfriend, and a retired cop, Stone sets out to hunt The Wrecking Crew, but soon he and his friends are dragged into a desperate race for survival, where the enemy can see every move they make and no one can be trusted. It sounds exciting! What influenced you to write “Wrecking Crew” and how long did it take you to finish the book? I’m an avid reader myself, but more recently I found that some of my favourite authors were making their storylines evermore fantastic and violent; perhaps they are being influenced by their publishers to follow a similar trend in action movies. I felt that there was a market for thrillers wit twisty plot lines that were exhilarating and interesting, whilst remaining firmly on this side of believable. Above all, I wanted my readers to think that Eric Stone’s actions were plausible, justified, and well thought out, without losing the air of excitement and adventure. “Wrecking Crew” is 100,000 words, which is about the average length of a thriller. It took a little over a year to write; I try and complete a book a year – although not always successfully! Is there a part of you in any character in Wrecking Crew? In some way every writer puts something of themselves into their characters, we can only write when we have that mirror of experience to relate to. Eric Stone is a karate black belt and so am I, but I am not Stone – for a start he’s much better looking. Every character has a little of someone we know in them, but it’s like bread and cakes; both contain flour, but the end result is very different. Do you have plans to write more books in this series? Absolutely! The second book is progressing nicely. In “Stone Façade” Eric Stone and his girlfriend Linda will travel to the West of Ireland to search for a missing journalist who was investigating a suspected people trafficking operation. In search of a more relaxed lifestyle, in 2003 my wife and I sold everything we had and moved to the West coast of rural Ireland. After almost ten years work renovating our dilapidated farmhouse, I decided to start writing full-time. 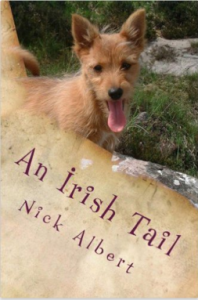 Along with a sports instructional book, I had been writing a column for a local paper for several years and when “An Irish Tail” came out in December 2012, it quickly topped the Amazon charts for comedy and dog stories. Also, I am delighted to report that “An Irish Tail” has just come out in audio format; it is available on Amazon, Audible, and iTunes. My books are available through Amazon, iTunes, and most major retailers.